← Question of the Month: I don’t like practicing backbends. How important is it that I incorporate them into my practice? 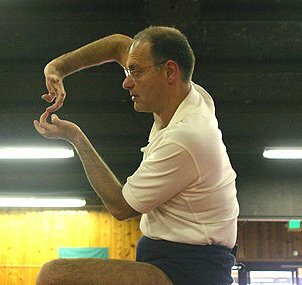 HIGHLIGHTS: Manouso Mano’s Iyengar Yoga Workshop, Cranston RI. Manouso showed an adjustment for Adho Mukha Svanasana that I had never seen before. If I can find a student volunteer, I will make a video of it. Most students who touch their heads onto the floor overstretch/sink into the shoulders. Other students think they can’t touch their head down when, in actuality, they can if they have the proper lift in the shoulders. The adjustment he taught us lifts what he calls the inner shoulder (the trapezius muscles along each side of the neck) and presses down with crossed thumbs at the 1st or 2nd thoracic vertebra. When this is done the student just releases amazingly into a full downward facing dog with the forehead on the floor. It looks pretty dramatic, but when you feel it yourself it’s a comforting release and is incredibly light. He also taught a variation of Halasana which is being used, with success, on deaf individuals in India. It is also highly effective as a curative for asthma, TMJ and sinusitis (and probably a number of other things that I didn’t note). The thing is, it is supposed to be incredibly uncomfortable, and IT IS. It is an intensely uncomfortable stretch from the occipital ridge all the way down to the mid-thoracic spine. In order for it to be effective, you have to practice it 2x per day, for 5 or 10 minutes, every day. Knowing how it feels to be in this pose, this is a daunting task. Once the practitioner has seen results, they can practice it less often. I am going to start practicing it for my TMJ and experiment with the results. I may make a video of this but, if I do, I will only distribute it privately to teachers and advanced practitioners, since I would not recommend beginners try this on their own. These are just two of the things I learned. I will try to put a blog together noting the immense information. I do recommend any teacher interested in learning deep nuances of asana, Pranayama and yoga therapy, to attend any workshop by Manouso. Manouso can be a little cantankerous, and he was during some of this weekend workshop. If you are sensitive to this, GET OVER IT and learn from a Master. This entry was posted in Uncategorized, yoga and tagged fitness, health, wellness, yoga. Bookmark the permalink.